John is from Castle Hill Baptist Church. A church with a long history of involvement with GRN Australia. John attended GRN Australia's 60th Anniversary Open Day on 25 May, 2013. He was very eager to learn about 5fish after receiving a brochure from a GRN representative two weeks prior. At the open day one of GRN's staff accessed 5fish.mobi on John's iPhone. Later that day John visited his 80 year old neighbour at Westmead Hospital. She satup on the bed amazed and bewildered as John shared the gospel with her using his phone. The lady was suffering from mild dimentia but was very concious of what she was seeing. John describes the impact of playing the recordings to her from his phone as amazing. Later that day a gentleman from Pakistan was speaking at his church. The Pakistani man was surprised that John could so easily find and play recordings in his own dialect. John describes 5fish as a 'very very effective and valuable tool for witnessing' providing 'instant access to the gospel'. It is a 'remarkable way to share the gospel'. John is now always concious that he now carries an 'instant tool for evangelism' in his pocket. He said you don't need to go overseas to evangelise using 5fish.mobi. John can't wait for the iPhone app to be released. 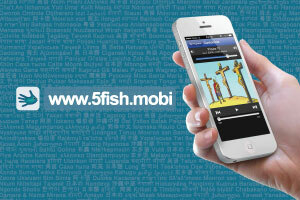 Find out more about 5fish.mobi now!